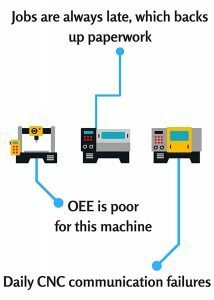 3 Reasons Your CNC Machinists Are NOT The Problem - SFA Inc. Problem 1: The operator is scrapping too many parts, or behind on the job. Problem 2: Most shops are also still loading from portable media like floppy disks or portable media. Answers for Problems 1 and 2: DNC Software can handle programs for thousands of machines and can help end CNC communication failures. Eliminate manual input of programs. Rest assured that Windows-based CNCs can connect to DNC software via a secure Ethernet connection, and that program transfers are encrypted, with Secure DNC. Problem 3: The machines are always down, so the machinists must be using them in an unfit manner. Answer for Problem 3: Machine monitoring will help track machine trends to help improve OEE and productivity. It will help so that everyone on and off the shop floor has easy-to-understand data on machine behavior. Know when to do maintenance, when there are tooling issues, or when materials are needed. This data can also be turned into actionable items through data-driven decision making. Problem 4: Jobs are not on time, which creates unsatisfied customers, so the machinists are causing me to lose business and profitability. Answer for Problem 4: The first solution is to adopt graphical job scheduling into your routine. The second solution is to look into Production Data Management (PDM) for your shop floor. This will help you go paperless, control revision and achieve compliance so you don’t have to worry about an audit. As you can see by these problems we highlighted, there is a solution for each. You not only have data to make you feel better about employees, but you will also be showing that you are a fair leader to your workforce. Have other shop floor issues that need solving? Feel free to ask us!